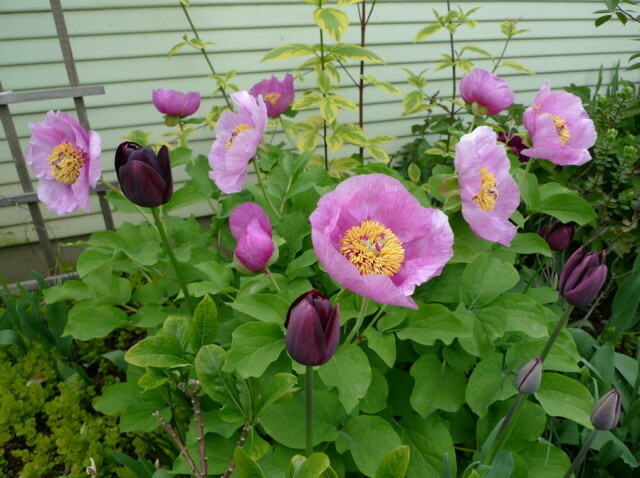 An unusual herbaceous peony I started from seed ten years ago (Paeonia daurica), in flower now with dark purple tulips. I need to add more of the black tulips to really take this up a notch. Note to self: add 20 Queen of Night tulips! It’s been a fine season for daffodils, tulips and other spring-flowering bulbs and the later Narcissus species and mid-season tulips are still looking snappy. - First, move (or just remove) what doesn’t work. If you discovered a bulb combination in your garden this spring that didn’t work for you – let’s say you don’t really like the bright yellow daffodils set against a pink flowering apricot tree, for example, or blueish crocus with a red flowering quince – move the bulbs now, while you remember what’s what. Dig them out with roots intact and transplant them where you want them. (Or put them in pots and give them away.) Water them in well (after watering, finish with a good splash of balanced liquid feed) and keep those leaves intact. They’ll flop – that’s okay. Just let them continue to grow as long as possible, as that provides the nutrients for next year’s flowers. Remove foliage only after it turns dry and brown. - Take pictures of what works. Photos are a fine and often overlooked tool to help you look back at the spring garden when fall rolls around. Because no matter how experienced you are, it’s easier to select spring combinations when you can see exactly what the garden looked like six months earlier. Do use an easy-to-remember key word for the photos (like "bulbs") so you can access the images readily on the computer come fall. You might also photograph any gaps of bare earth or greenery in the spring garden that seem to be crying out for something sparkly in springtime. Think of bulbs as the accessories of the garden. Like sparkly jewels can set off a dress, glowing tulips or narcissus can turn a plain, often brown and green spring garden dazzling. And even more so given how gray and rainy it is in springtime here. Photographing bare spaces will help you pick how many bulbs to buy and guide you on where to plant them. If you aren’t big on photography, just jot yourself some notes in a garden notebook or garden file. For example, "Note to Self: plant two dozen, tall white daffodils around the blue oat grasses in the front garden". Or whatever. - Take your planning a few steps further by reviewing catalogs now – and make your choices while it’s all fresh in your memory. Since the bulbs are up and flowering now, or just fading, you can still envision what’s on the pages of the catalog against the existing/fading flowers in your own garden. Make a list of what you’d plant where and slip it into the catalog. Forgetful? Put it in your September calendar.